UK Biodiversity Action Plan (BAP) habitats are habitats that have been identified as the most important to conserve and enhance. Since the NERC Act came into force in 2006, all local authorities have a duty to do this. Bracknell Forest Council meets this duty through their own Biodiversity Action Plan. In 2011/12 TVERC updated existing habitat information, mapping a total of 1,200 hectares in the District. We used our existing database of mapped habitat, aerial photos, new field surveys and digital datasets to establish where the good quality habitat was in Bracknell Forest. 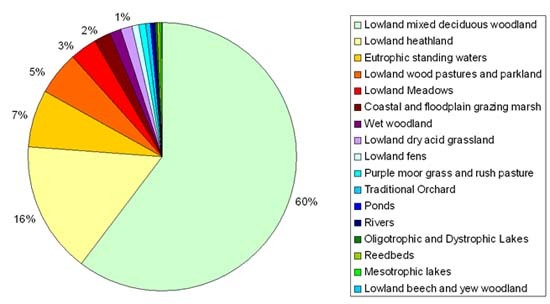 The results showed that lowland mixed deciduous woodland remains the most abundant habitat. We’ve mapped more heathland especially after a careful look at the Thames Basin Heaths, south of Bracknell, where some restoration has been carried out. Swinley Park and some of the old Council managed parks in and around Bracknell form much of the area of parkland habitat. Eutrophic standing waters are mainly the gravel pits in the Blackwater Valley, where the largest area of lowland meadow habitat is also found, though we’re already looking at a rare habitat. After that the other habitats are very rare indeed. The information provided a baseline for the development of the new Bracknell Forest BAP. This new BAP will help conserve and enhance biodiversity within the Bracknell Forest area.